Dress rehearsal of the crapshooters dance. Staged and lit like a Diego Rivera mural. This is Max’s first year as an official Burns Park Players cast-member. I tell you, the show takes on a whole other significance for me now that Max gets the magical experience of being one of the kids on stage. This is something he’s been chomping at the bit to do ever since first becoming aware of the Players (their 2006 production of Fiddler on the Roof made quite an impression on him). And he simply can’t get enough of it! But the road to theatrical bliss did have a few bumps: Max had to rebound from the disappointment of losing the part of Nathan Detroit to Joel Swanson, and then — to rub salt in the only partially healed wounds — losing the part of street-smart wiseguy to the entire male cohort of the 3rd–5th grades! Max has made his peace with this, though, and magnanimously embraced his roll as a member of the mission choir; he’s the consummate professional. It helped when I told him that the missionaries get to boss the gangsters around. Plus, by playing against type — i.e., straight-laced, soul-saving, teetotalling — he gets to showcase his extraordinary acting range, and reduce the risk of being pigeonholed for the rest of his career as the ruffian/crook. In other — i.e., not specifically Max-related — news… THIS SHOW IS AWESOME! (But don’t just take my word for it.) I’m blown away by the energy, dedication, generosity, and — why beat around the bush? — raw talent of my neighbors. I am honored to be involved with these folks, and delighted to count myself among the audience members come showtime. 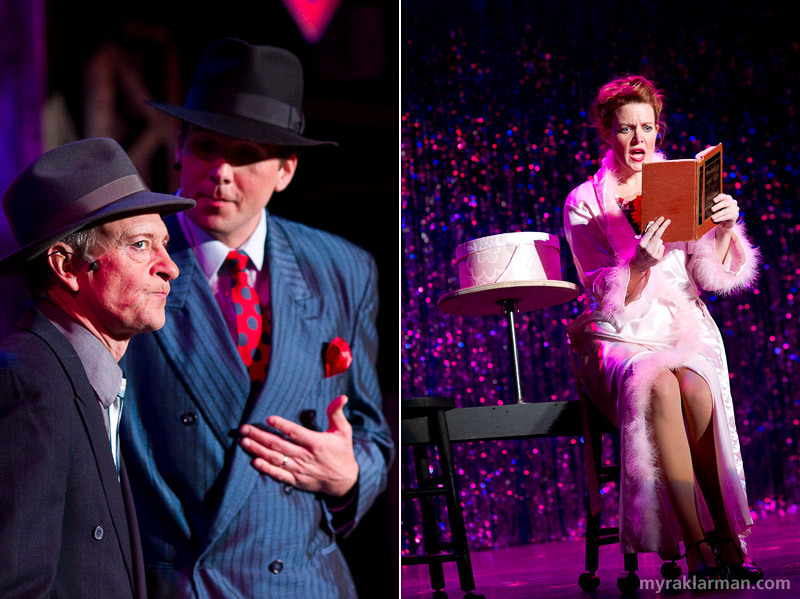 If you haven’t yet caught this show, there’s still time to mend your ways and stray no more! Available NOW at Morgan & York (1928 Packard, Ann Arbor), or at the door one hour before showtime. You’ll enjoy the best seats in the house and reserved parking. To purchase, please contact Ken Kollman at 734-478-0449. 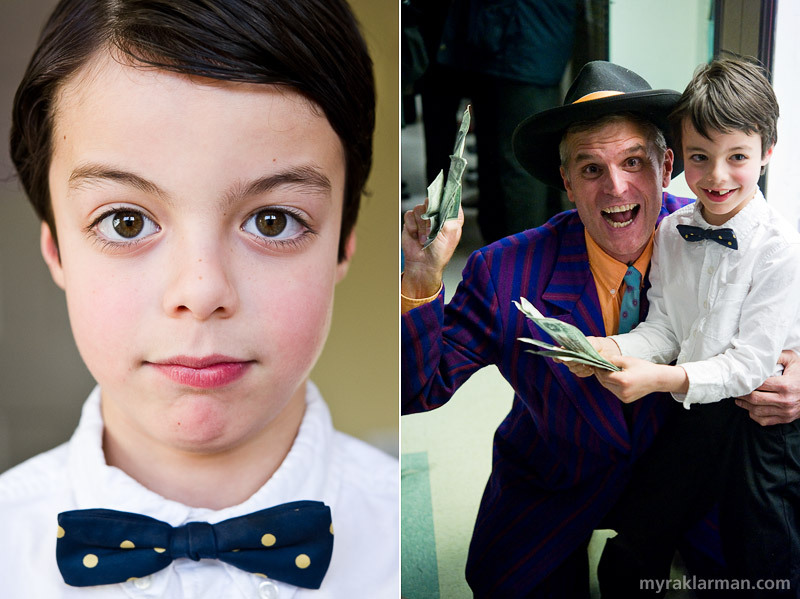 The youngest castmembers in Guys and Dolls are the first graders (that’s Max in the middle). | The oldest castmember, 90-year-old Fredda Clisham, threatens to steal every scene she’s in. Her “blind” beggar-lady character is hilarious. 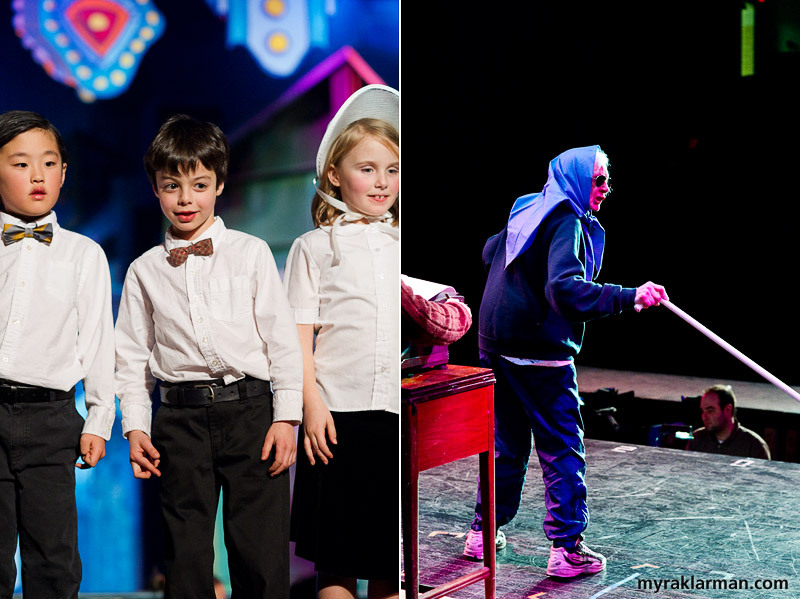 The kids get to perform alongside the adults, and sometimes with their own parents! 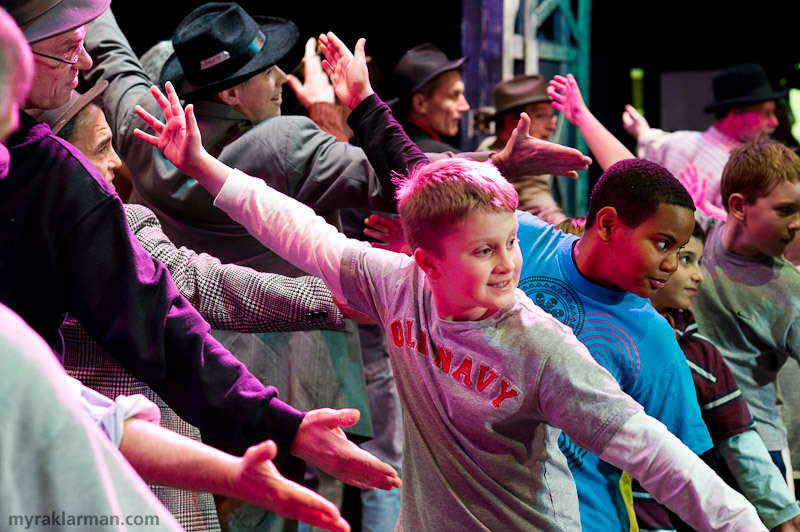 Here the fourth-grade boys rehearse a number added from the movie version of Guys and Dolls, Miss Adelaide. 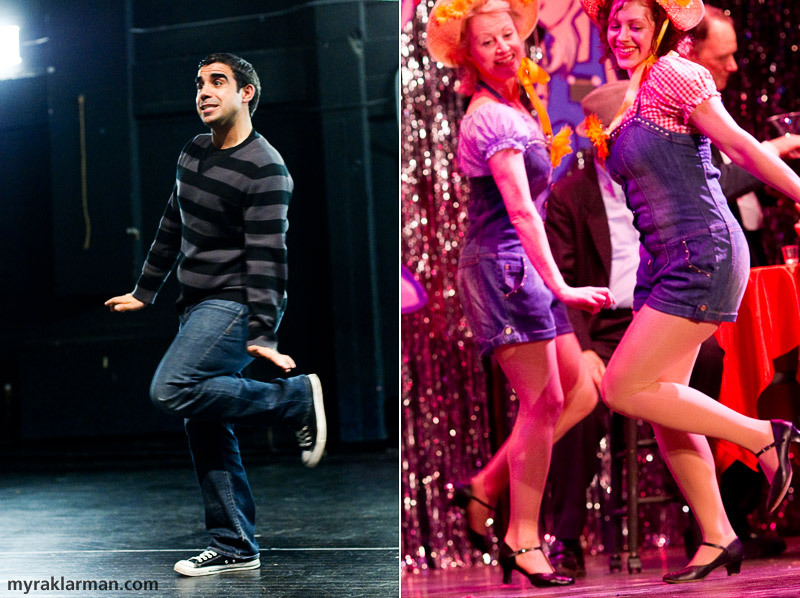 I wonder where director Mike Mosallam learned his moves? | Hot Box dancers, including Sally Pinnell and choreographer Susannah Stempke, rehearse A Bushel and a Peck. 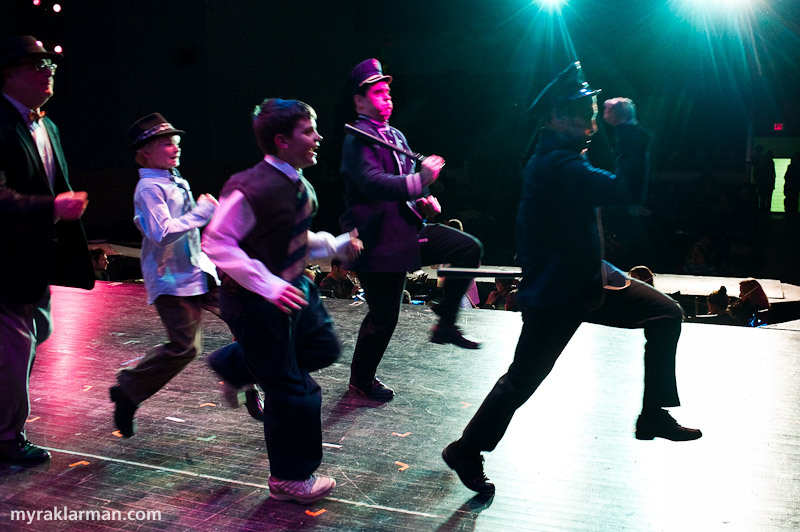 One of my favorite moments in the show to photograph from upstage: two policemen (Fred Hall and Steve Gradwohl), two fifth-grade boys, and the victim (Alan Dengiz) chase a pickpocket. 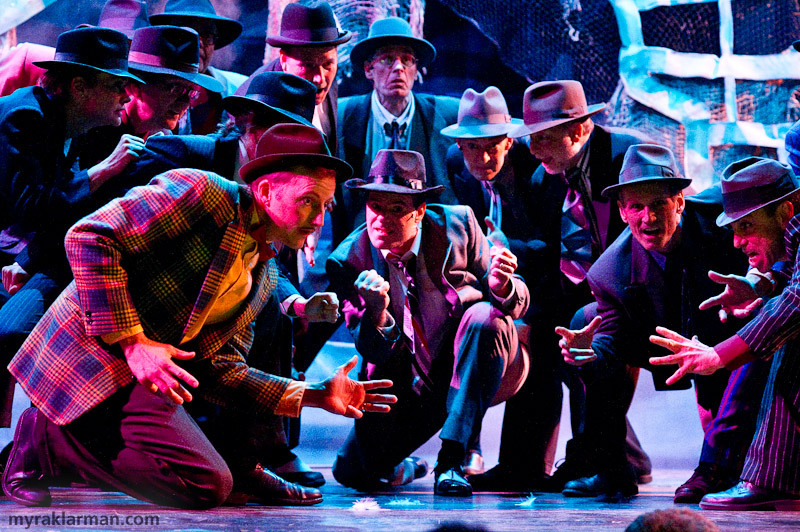 Sally Pinnell is one of the shadowy dancers in the background of the Havana scene. | During rehearsals, the mix of costumes and street clothes can lead to some unexpected juxtapositions. 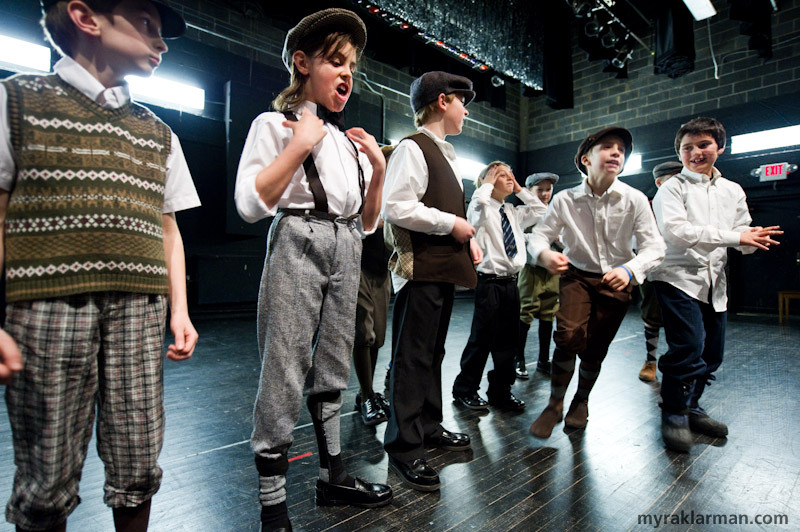 Fourth-grade, knickerbocker-clad boys horsing around — er, getting in touch with their characters’ NYC moxie — during a rehearsal. 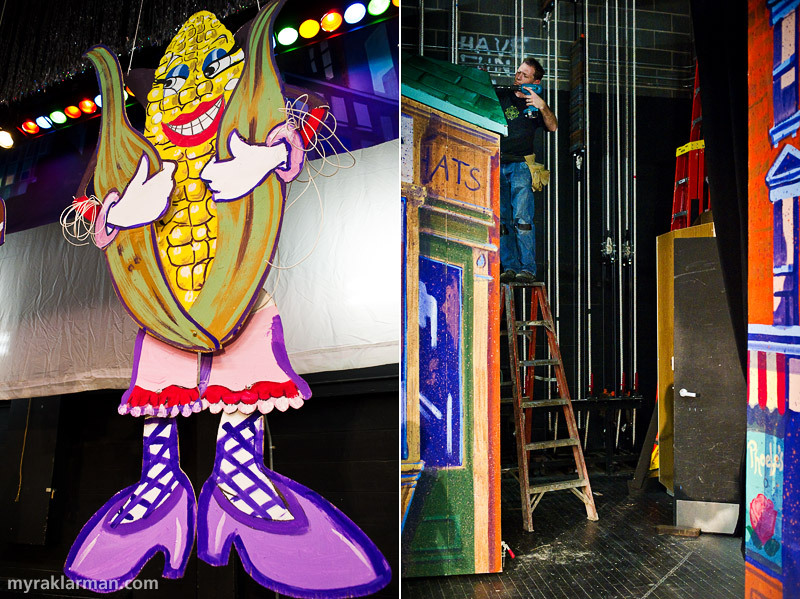 This corn shakes a leg (literally) in A Bushel and a Peck. | The sets are lush and ingenious, thanks to the entire crew led by set designers Mark Tucker and Jeri Rosenberg and set crew head Jim Wallace (standing atop ladder in non–OSHA compliant fashion). 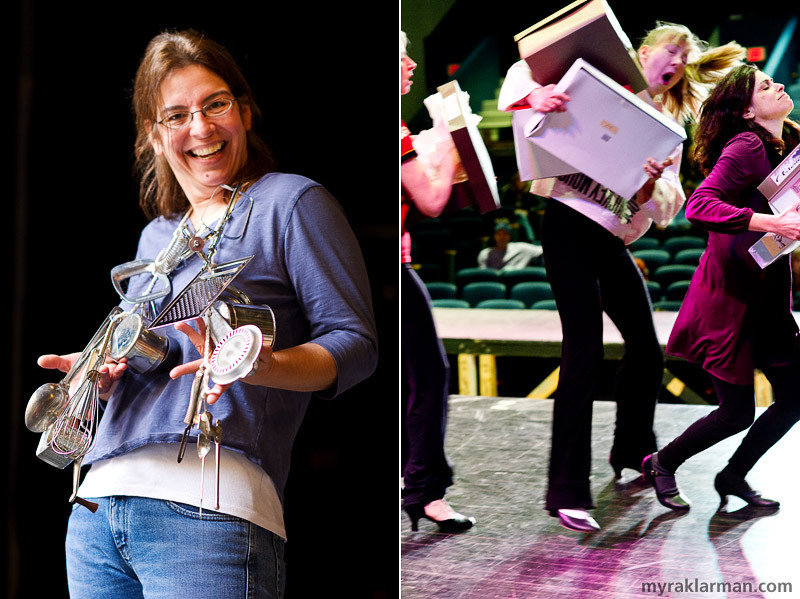 Major props go to props crew head Claudia Boschitz for “propping up” the show with period-sensitive stuff. | Runyonland: Alicia McHugh and Julie Halpert, with their stacks of boxes, have convincingly fallen over each other countless times. A nervous and conniving Joel Swanson (Nathan Detroit) vs. a cool and debonair Jeff Robinson (Sky Masterson). | Eva Rosenwald (Miss Adelaide) brings the perfect mix of humor, heartbreak, and hope to Adelaide’s Lament. 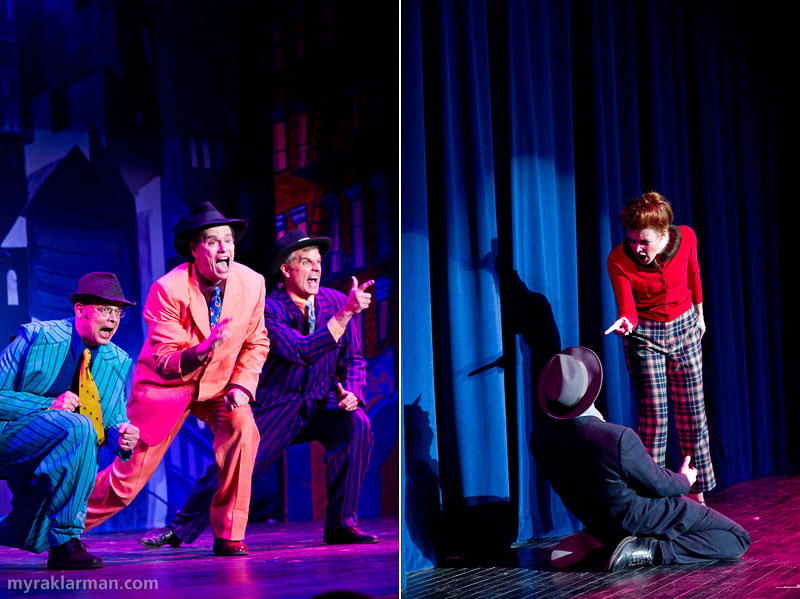 Tim McKay, Vic Strecher, and Clinch Steward (Nicely-Nicely Johnson, Rusty Charlie, and Benny Southstreet) in the number Guys and Dolls | Eva Rosenwald and Joel Swanson (Miss Adelaide and Nathan Detroit) bring down the house in Sue Me. Max is styled and ready to reform those sinners in last Saturday’s matinee. He loved being a member of Sargent Sarah’s choir. 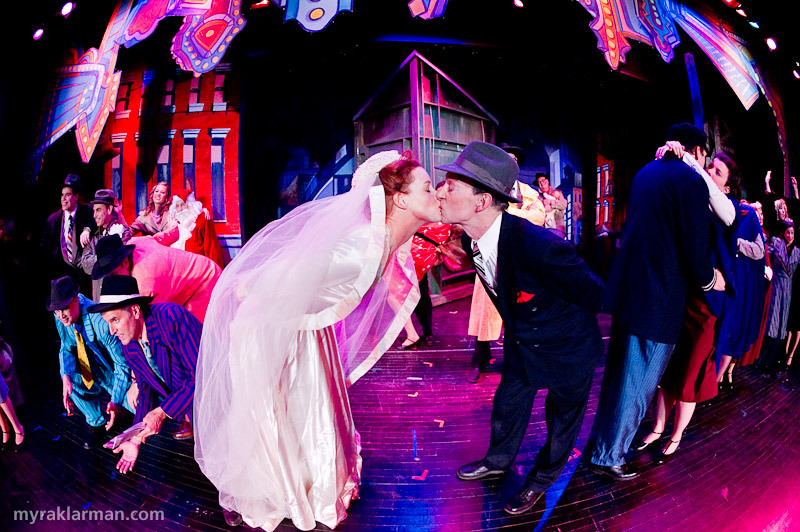 | By show’s end Clinch Steward (Benny Southstreet) had “corrupted” Max with some prop moolah. The happy ending, as seen through my fisheye lens. Oh Max, how I adore thee? He is so cute, Myra! I can’t even imagine how proud you must be of your little man. Bravo!!! The show itself was unbelievably great and, Myra, your pictures make the fabulous memories linger. Thanks for all you do. Now this is a neighborhood association worth joining (pity I’m too far away). Looks immensely fun, what a great experience for Max too – great pix Myra! “Dropped” into your blog via Festival Fools via Pure Michigan, what a treat to find BP Players! Had my own 2nd grade BP Player, in Crazy for You, some 13 years ago now. 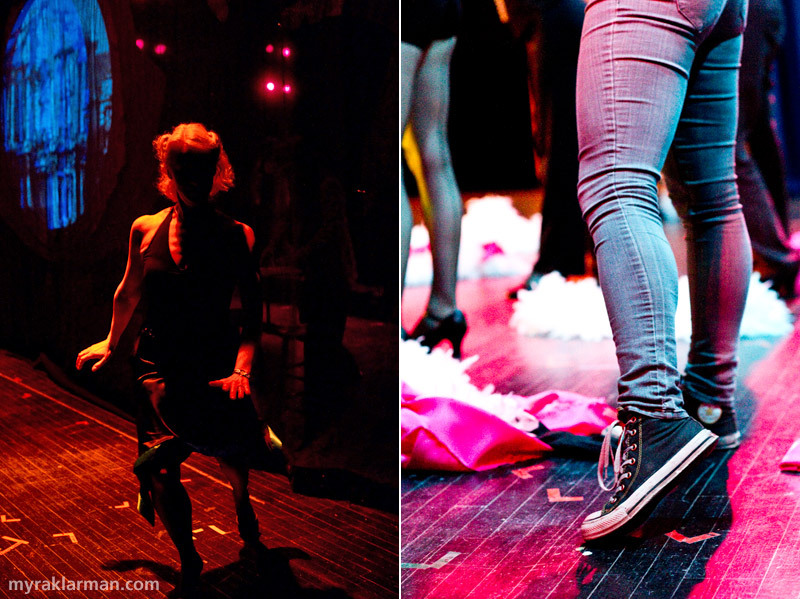 We moved away that summer, but truly beautiful to relive the theatre thrill through your photos. Good Times!